Move online, keep the paper! Today people are looking for information online! 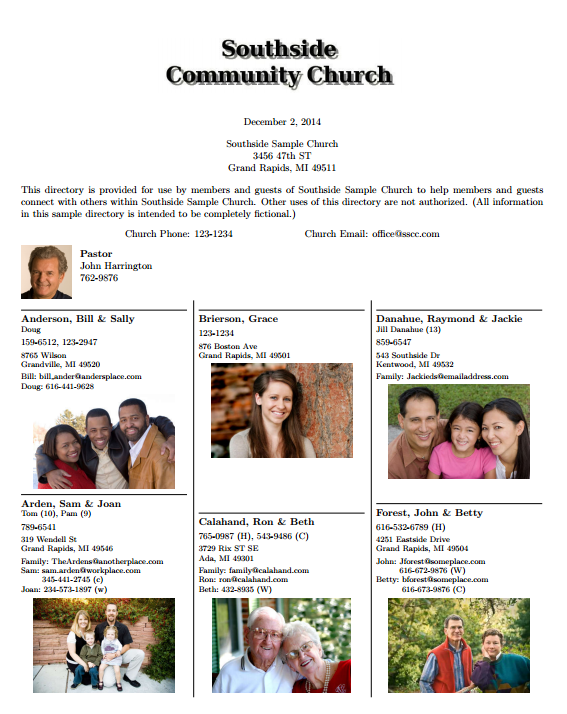 Connections Online Photo Directory provides a simple, secure, and easy way to maintain your directory and give people online access while still providing a printable PDF directory for those who need access offline, prefer paper or are uncomfortable with online tools. The best way to get a feel for Connections Online Photo Directory is to explore the sample directory. Log in using user "sample" and password "sample." If you like what you see you can start your own directory with 30 days of free access. Start your directory TODAY!. Support for initialization and synchronization with Servant Keeper. This makes it very easy to get started and maintain your photo directory from Servant Keeper data. Miscellaneous other upgrades and bug fixes. Photo cropping and zooming in your browser! No more adjusting photos in a separate program prior to submission. Batch importing and updating from excel files gets you started quickly. Custom fields: You can add custom fields for your entries to allow you to keep track many what your want. The interface and menus are clean fresh and intuitive. Printable directory options: The picture directory and the text directory may have different content. See Connections Facebook page for more details and developments. The links below provide quick summaries. More detailed information can be found by using the menu links above.